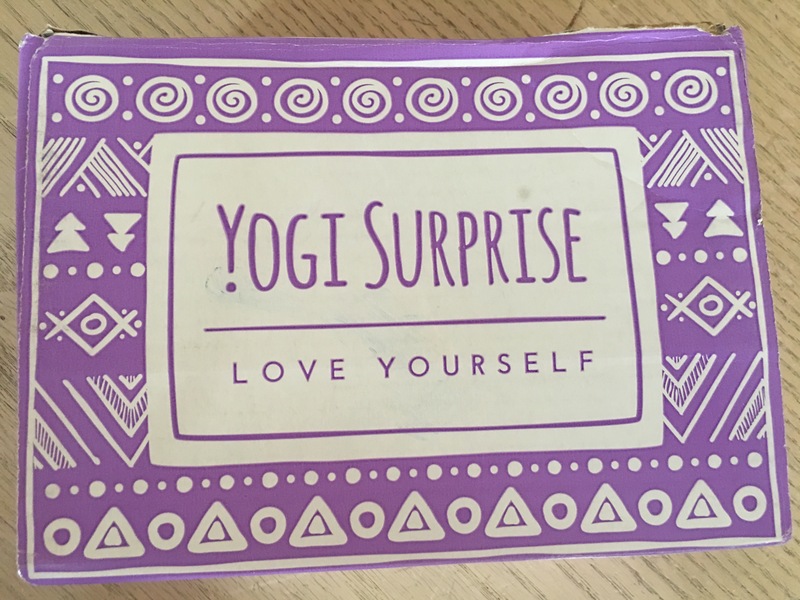 Yogi Surprise is a monthly yoga inspired subscription box designed to complement your way of being, your active lifestyle of vitality and growth. Each box offers the perfect way to nurture and support your mindful life of movement, from wakeful sun salutation to inspiring evening reflections. 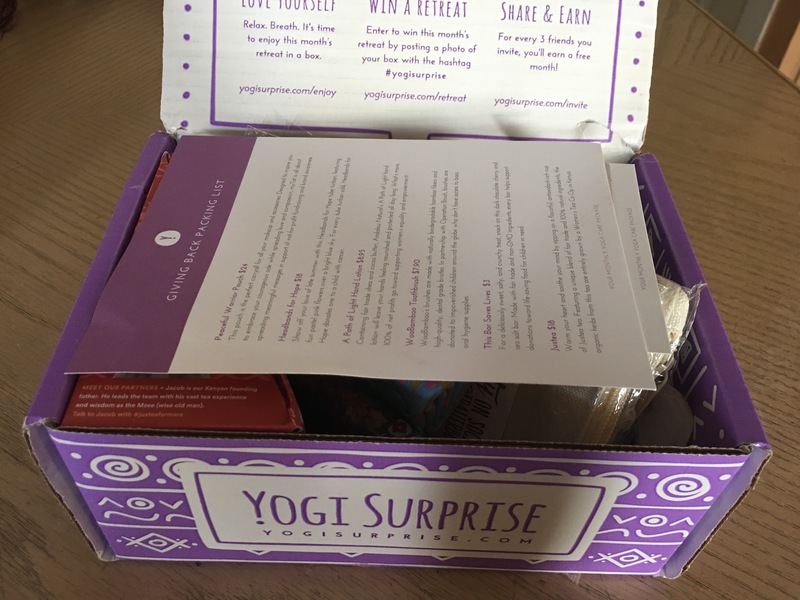 We all agree that a life of wellness begins by loving yourself, and what better way to raise personal compassion than a monthly box of bliss. 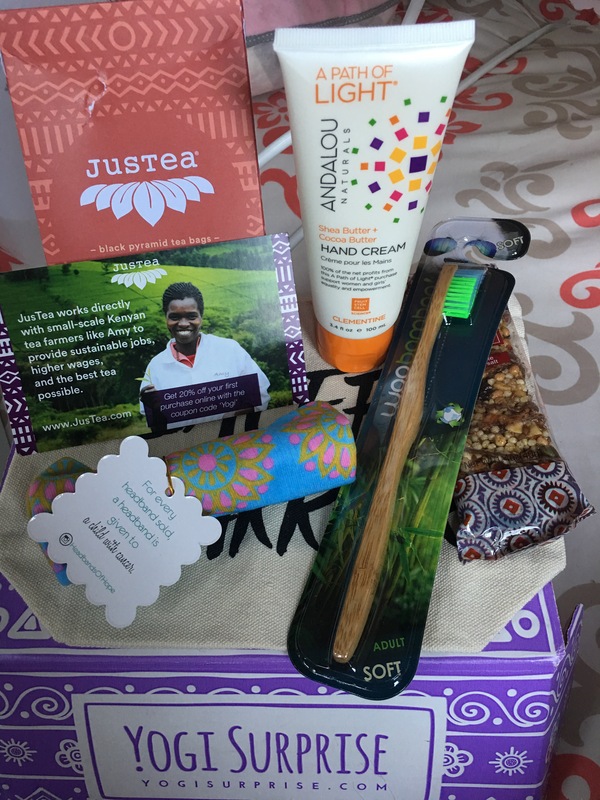 Ill be reviewing the August 2017 Lifestyle box , this months theme is Giving back which means that every product in this months box is from an organization that supports a related cause. This pouch is perfect for carrying your makeup and accessories. I like to use these pouches to keep my make up and hair scrunches organized when I travel. This seamless headband is 100% polyester. For every Headband sold Hope donates one to a child with cancer. They also have their own subscription box. This hand cream contains fair trade Shea and coco butter, I like the light clementine smell it has and it sure does a great job at moisturizing and leaving your hands nice and smooth. woo Bamboo Eco Toothbrushes are made with bamboo that’s organically grown, biodegradable, sustainable, and antimicrobial. It has a coating of Chinese white wax coupled with the already anti-microbial nature of bamboo so you can be sure you are doing something healthy for your mouth and not gathering a germ fest on the handle. For every bar sold they give life-saving food to a child in need. this bar is a perfect snack, its gluten free, Non-GMO, fair trade and dairy free. Taste really good too. I am excited to try this flavor, I usually stick to peppermint or chamomile tea. JusTea is fair trade and 100 % natural ingredients. the organic herbs from this tea are entirely grown by a women’s tea co-op in Kenya.